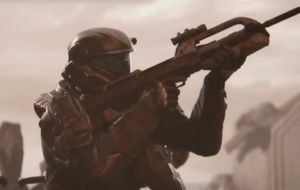 Private Walpole was a UNSC Marine Shock Trooper under the command of Gunnery Sergeant Marcus Stacker, and was assigned to the 7th Battalion, 105th ODST Division in 2552. Walpole and Butkus taking aim. His unit, second squad, 7th Battalion of the 105th ODST Division, fought in the Battle of Earth, during the Battle of Mombasa in October 2552. During the battle, he and his squad were in Stacker's D77-TC Pelican dropship when it was shot down by a Type-47A Scarab walker on approach to an area in New Mombasa, Kenya. After their Pelican made a rough landing outside of an abandoned beachside hotel in Old Mombasa, Walpole reported that O'Brien was killed on impact. He, along with his squad quickly moved out to get better cover, and headed toward Hotel Zanzibar. Moments later, a plasma grenade had landed on Walpole's helmet. Using quick reflexes, the ODST was able to remove his headgear and hurl it toward a camouflaged SpecOps Sangheili's position on higher ground. There, Sergeant Stacker and his team saw the charging soldier, only after it had held Jones as a prisoner. Butkus opened fire with an overcharged plasma pistol at the Sangheili, as Stacker shot the Elite in the head with his BR55 battle rifle. He is named after Bungie employee, Nathan Walpole.